It can often be difficult to resist the temptation to look at your smart phones at any point in the day, let alone when behind the wheel. Shockingly, eight in ten (84%) of motorists across the UK admitted that they get easily distracted behind the wheel. This is up from 76% in 2018 according to a study conducted by Floow. The law states that it is illegal to hold a phone or sat nav while driving or riding a motorcycle. Drivers must have hands-free access to devices such as a Bluetooth headset, voice command, dashboard holders or built-in sat navs to avoid distraction. Additionally, the hands-free device of the driver’s choice must not block their view of the road and traffic ahead of them. The consequences for ignoring these rules are 6 penalty points and a £200 fine if a driver is seen using a hand-held phone while mobile. Drivers will also lose their licence if they have passed their test within the last two years. When aligning this with accidents on the road, more than a third of fatal car crashes in the UK are a direct result of a time when a driver is distracted, and this problem is worsening. Around three in five (58%) respondents to the study admitted to taking their eyes off the road when attempting to change radio station, while just over half (51%) of UK drivers admitted to having a singalong to a tune while on the road. Other honest respondents voted activities such as drinking, eating, having an argument with a passenger and even daydreaming which featured within the top ten driver distractions. 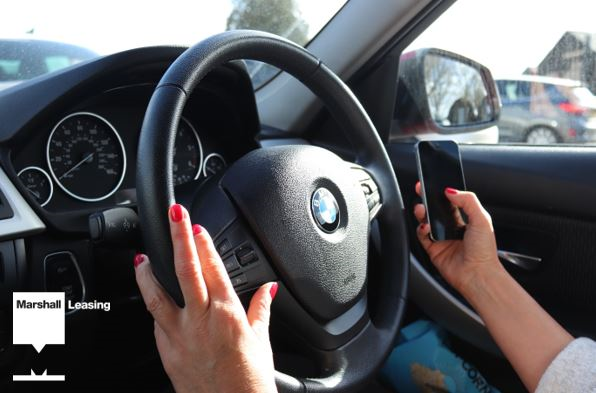 With regards to UK hotspots, the West Midlands has recently overtaken the East Midlands as the region where drivers are most likely to admit to distraction when behind the wheel, with as many as 88% of respondents admitting these faults. As a result of concerns such as this, we at Marshall Leasing offer a fully encompassing driver licence validation service through our business partners, The Licence Bureau. This is an online service which allows you to easily ascertain the potential risk each of your drivers pose. After a driver mandate has been completed, the results are then received from the DVLA directly. This is a crucial tool to assess the driver behaviour of those in your fleet, and to keep safety and security at the top of your priority list. To find out more on how Marshall Leasing can help with all of your fleet and safety requirements, please visit our dedicated ‘Driver Risk Assessment & Licence Validation’ page on our website here, or call us directly on 01480 414541.